Boyun Xu, Chang Liu, Lianfen Qian, Yue Qu, Weijue Su, Jialing Xu, Junzhao Zhao. Statistical Modelling Outcome of In Vitro Fertilization and Intracytoplasmic Sperm Injection: A Single Centre Study, Combinatorical Chemistry & High Throughput Screening. 22(2019), 1-7. DOI:10.2174/1386207322666190404145448. Kurt Schesser, Sara Schesser Bartra, Cherish Lorica, Lianfen Qian, Xin Gong, Wael Bahnan, Henry Barreras, Jr., Rosemely Hernandez, Zhongwei Li, Gregory Plano. Chromosomally encoded Yersinia pestis type III secretion effector proteins promote infection in cells and in mice. Frontiers in Cellular and Infection Microbiology, section Molecular Bacterial Pathogenesis. 22 Feb., 2019. Online access (pdf). Qian, L.F. Prevention from ageing: a brief survey. SM Preventive Medicine and Public Health. 2018: 2(4), 1026. Yuan Ye and Qian LF. The Analytic network study of financial spatial correlation in China. Journal of Wenzhou University. 39(3) (2018), 38-46. Golinko, E. and Qian, L.F. A min.max algorithm for spline based modeling of violent crime rates in USA. https://arxiv.org/abs/1804.06806, 2018. Li, Y.X. and Qian, L.F. Likelihood ratio test for a piecewise continuous Weibull model with an unknown change point. Journal of Mathematical Analysis and Applications, 412 (2014) no.1, 498-504. Zhang, W.; Qian, L. F.and Li, Y.X. Semiparametric sequential testing for multiple change points in Piecewise Constant Hazard Functions with Long-term Survivors, Communications in Statistics-Simulation and Computation, 43:7 (2014), 1685-1699. Qian, L.F. and Zhang,W. Multiple Change-point Detection in Piecewise Exponential Hazard Regression Model with Long-term Survivors and Right Censoring. Contemporary Developments in Statistical Theory, A Festschrift for Hira Lal Koul,Springer Proceedings in Mathematics & Statistics, 68 (2014), 1387-1418. Long, H.W. and Qian, L.F. Nadaraya-Watson estimator for stochastic processes driven by stable Levy motions. Electronic Journal of Statistics, 7 (2013), 1387-1418. Li, Y.X, Qian, L.F. and Zhang, W. Estimation in a change-point hazard regression model with long-term survivors. Statistics & Probability Letters, 83 (2013), 1683-1691. Dr. Qian serves on editorial board for several statistical journals such as Statistics & Probability Letters, and Advance Probability and Statistics. She is a reviewer for MathSciNet, Technometrics, and a professional referee for many statistical journals. She has successfully supervised many MS and PhD students in the past twenty years. Dr. Qian is the award-winning mentor of the first-place winner in US 2015 Undergraduate Statistics Research Project Competition sponsored by ASA/CAUSE. Dr. Qian is a Project NExT Fellow chosen by the Mathematical Association of American and serves as Math Appliance mentor. Dr. Qian collaborates with various researchers from many institutions and different fields including finance and business, biology and biomedical science, computer science and engineering, and the government. She offers to consult to FAU researchers and the local community. Dr. Qian has published about forty refereed papers in top statistics journals such as Biometrika and Computational Statistics & Data Analysis and edited one book. Her research interests are on change point detection and efficient estimation for independent data, dependent data, survival data, longitudinal data analysis and post-selection inference for high dimensional data. She is typically familiar with the two-phase regression model, threshold time series models, linear and partial linear models for longitudinal data, and survival Cox proportional regression models for lifetime data. She uses both parametric methods such as least squares, maximum likelihood, and robust method, and non-parametric methods such as empirical likelihood and kernel smoothing as estimation tools. Recently, Dr. Qian is interested in big data analysis on Statistical learning and Post-Selection Inference for high dimensional data. Dr. Qian is a member of FAU Harbor Branch Pillar, Bimedical Research Pillar, and affliate faculty of Peace, Justice and Human Rights Initiative. Dr. Qian has successfully supervised four Ph. D. students: Dr. Zhihua Liu, Dr. Wei Zhang, Dr. Fazhe Chang and Dr. Durga Kutal. Zhang, W.; Qian, L. F. and Li, Y.X. Semiparametric sequential testing for multiple change points in Piecewise Constant Hazard Functions With Long-term Survivors, Communications in Statistics-Simulation and Computation, 43:7 (2014), 1685-1699. Qian, L.F. and Zhang,W. Multiple Change-point Detection in Piecewise Exponential Hazard Regression Model with Long-term Survivors and Right Censoring. Contemporary Developments in Statistical Theory, A Festschrift for Hira Lal Koul,Springer Proceedings in Mathematics & Statistics, 68 (2014), 287-304. Chang, F.Z. and Qian, L. F. Maximum Likelihood Estimator of AUC for a Bi-Exponentiated Weibull Model. ISRN Probability and Statistics, http://dx.doi.org/10.1155/2013/965972. 2013. Qian, L.F. The Fisher information matrix for a three-parameter exponentiated Weibull distribution under type II censoring. Statistical Methodology. 9 (2012) no 3, 320-329. Online access. Qian, L. F., Yao, Q. C. and Khoshgoftaar, T. M. Dynamic two-phase truncated Rayleigh model for release date prediction of software. Journal of Software Engineering & Applications. 3 (2010), 603-609. Wang, S.J., Qian, L.F. and Carroll, R.J. Generalized Empirical Likelihood Methods for Analyzing Longitudinal Data. Biometrika, 97 (2010), no 1., 79-93. Liu, Z. and Qian, L.F. Change-point Estimation in a Segmented Linear Regression via Empirical Likelihood. Communications in Statistics - Simulation and Computation 39 (2010), no 1, 85-100. Qian, L.F. and Yao, Q. C. Estimating software project effort using piecewise linear regression models, (with Yao, Q.). Proceedings of The 15th Annual Motorola Software Engineering Symposium (SES 2002). Austin, F. D., Kaoru Kitajima, Yoshiaki Yoneda and Qian, L. F.. A putative tropical American plant, Ipomoea Nil (Convolvulaceae), in pre-Columbian Japanese art. Economic Botany 55(4) (2001), 515-527. System and Bayesian Reliability: Essays in Honor of Professor richard E. Barlow on His 70th Birthday edited by Yu Hayakawa, Telba Irony and Min Xie, World Scientific, 2001. American Mathematical Reviews. Regularized radial basis function networks: Theory and applications by Paul V. Yee and Simon Haykin, New York: Wiley, 2001. Technometrics. August (2002), Vol. 44, No. 3. Probability applications in mechanical design by Franklin E. Fisher and Joy R. Fisher, New York: Marcel Dekker, 2000.Technometrics. November (2001), Vol. 43, no. 4, p. 490. Nonparametric curve estimation: methods, theory and applications by Sam Efromovich, New York: Springer-Verlag, 1999. Technometrics. 42 (2000), pp. 429. I believe that students are guided by the faculty in their pursuit of knowledge. A knowledgeable and caring faculty can make a positive inference in the students' lives. Students may be different in their efforts of engaging in learning: Some of them are self-motivated, others need periodical encouragement, and still others require a constant push. However, a responsible faculty should make sure that all students who are eager to learn are provided with the means to learn. Successful teaching is very important to me. I think of teaching as helping students and sharing with them what I have already learned. 2017-2019 CASEC Distinguished Service Award , South Florida. 2015 Undergraduate Statistics Research project Competition First Place Award (Advisor), ASA/CAUSE. 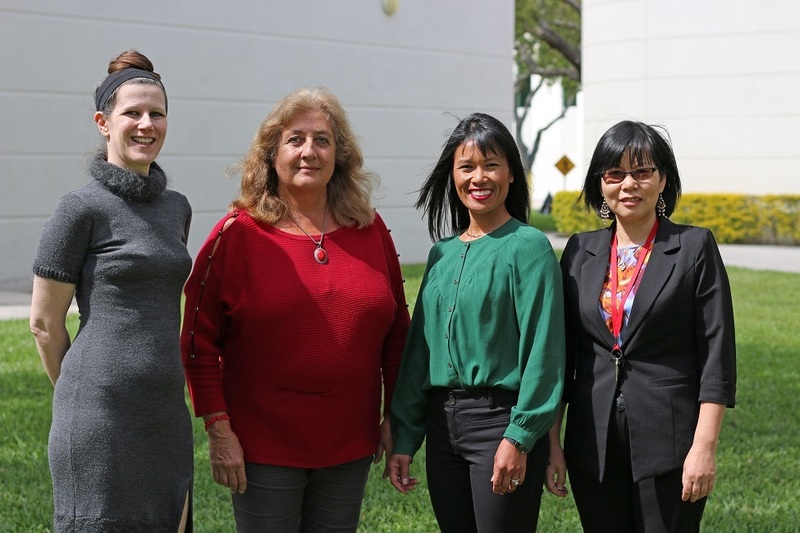 The Department of Mathematical Sciences at FAU provides a Statistical Consulting Service (SCS). The SCS does not have the resources to provide unlimited free consulting. However, there is no charge for the initial contact and discussions. If extensive consultation is required, the service should be supported by the clients. The SCS can be arranged by calling (561) 297-2486 to make an appointment. President of ASA South Florida Chapter. Treasurer of AWIS at FAU. Florida Atlantic University hosted the Big Data Science Conference on 10/13/2018. The purpose of the workshop is to bring together the research interests of Florida Atlantic University faculty and local industry leaders to stimulate collaboration between the two parties in the area of data science and analytics. We hope to build cohesiveness among all of the varied and differing groups engaged in such work among the local community and beyond. Conference photos, please visit photos. We already start the planning for FAU 2019 Big Data Conference. If you are interested in sponsoring the conference, please contact me at Lqian@fau.edu. More updates will be posted via Math Event page. The FAU & eCOTS 2018 Florida Southern Regional Statistics and Data Science Conference was held on May 19th of 2018 at Florida Atlantic University. The face-to-face regional conference will focus on Statistical Education with a theme on Data Science for ALL. The one day conference on Statistics and Data Science for All is sponsored by the Chinese Association of Science, Education, and Culture (CASEC), CAUSE eCOTS 2018, Palm Beach Chinese Academy, Modernizing Medicine and ASA South Florida Chapter. Please check out the conference program HERE and more details HERE. The FAU & eCOTS 2016 Florida Southern Regional Statistics and Data Science Conference was held on May 14th of 2016 at Florida Atlantic University. The face-to-face regional conference will focus on Statistical Education with a theme on Changing with Technology. For more details, please visit 2016 FAU & eCOTS Southern Florida Regional Changing with Technology. Workshop on Statistical Analysis of Large Administrative Health Databases, Feb. 17-22, 2019, Banff, Alberta, Canada. Chinese Economists Society 2019 North America Conference, April 5-7, 2019, Lawrence, KS, USA. International Conference on Statistics Distributions and Applications (ICOSDA 2019), Oct. 10-12, 2019, Grand Rapids, MI, USA. The 2019 11th ICSA International Conference, December 20-22, 2019, Hangzhou, Zhejiang, China.